Abnormal internal pressure fluctuations (or transients) are involved in over 40% of hydropower penstock, manifold and turbine casing ruptures. Causes are multiple but always associated with the hydraulic functioning. Drifts of the settings managing the turbine start up and shut down operations, defaults of key components, are commonly involved in these events. In the absence of monitoring, these risky trends go unnoticed until they turn into causes of rupture. Despite their mechanical harmfulness, transient behaviours are not monitored continuously. Only a few pressure measurements are made during manual tripping and load rejection tests. But these tests only make it possible to reproduce one single hydraulic phenomenon: the hammering of mass.Thereby forgetting all the other types of hydraulic phenomena that can affect the penstock safety. Sometime post-rupture analysis are made. But unfortunately, where the worst has already happened. So, it is often to late to have a thorough understanding of the hydraulic phenomena in question and related loading. And it is then difficult to take from these ruptures a reusable experience to improve the operation safety of penstocks. Overpressure (mass water hammer or wave water hammer) which is created when the intake flow drops abruptly. If the closure time is higher than the reflecting time of the penstock , a mass water hammer happens. If the closure time is below the reflecting time, a wave water hammer happens. Water column separation which occurs during a quick opening of a valve or a fast turbine start-up. If the opening time is below the reflecting time of the penstock. This creates a vacuum cavity in the pipe. This cavity then implodes when the pressure recovers causing extreme pressure. Resonance or self sustained pressure oscillations. This may occur during no load unit operation. Or during rough operating of Francis turbine. Or even when the plant is completely stopped due to guard valve leakage instability . Tripping of reaction hydraulic turbines may lead to a sudden increase of the draft tube rope vortex volume, as well as the separation of the draft tube water column . Reverse water hammers may thus happen when the pressure recovers, the turbine casing and runner exhibiting high pressure surges. These well-known phenomena are taken into account during the turbine design stage. Mitigation measures are developed such as adapted setting of the speed governor, venting valve implementation to prevent the occurrence of void cavities in the turbine casing, etc. However, drifts in speed governor settings or a malfunction of the venting device are common. These faults can slowly but surely worsen the transient behaviour in the turbine draft tube. Without a continuous monitoring, thorough understanding and estimation of these phenomenon are not managed. Major damages such as blade failures of axial runners or shaft line lifting with thrust bearing damage, are thus encountered in low head plants. Its possible to detect, quantify and predict all the dangerous hydraulic phenomena affecting penstock and turbine structures. That is what continuous monitoring over the entire pipe system length brings. By embedding operation processes expert rules, advanced signal processing methods , HYDROSURGE provides key insights on the root cause of the phenomena. 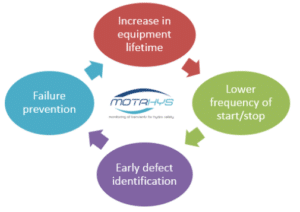 MOTRHYS suggests corrective or preventive actions. So allowing to improve equipment lifetime, reducing production downtime and ultimately improving the operator bottom line.